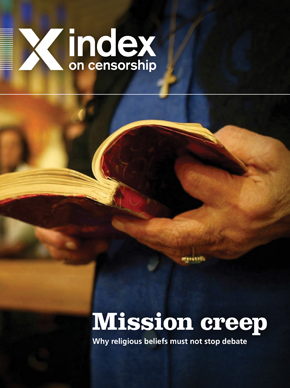 I had two translations in this edition of Index on Censorship magazine. When writer Lucien Bourjeily made censorship the theme of his latest play, he knew he was in for a battle. And he was right. His play about censorship ended up being banned. Not surprisingly, he thinks this decision tells its own story about Lebanon today. In this extract from Will It Pass or Not?–published for the first time in English–Lucien Bourjeily exposes the ridiculousness – and arbitrary nature – of the Lebanese Censorship Bureau, which commonly bans material that is deemed to be obscene, offensive to religions or politically sensitive. In a story written for this publication, Syrian dissident author Samar Yazbek reflects on what it’s like to be a writer of fiction faced with the violence and atrocities of civil war and asks: how can we produce literature right now, in this era of bloodshed?